Innovative shapes encounter newly defined classics, delicate easiness with ethnic worlds of patterns is contrasted with a new nonchalance: (be) authentic and unique ! The summer „10“, the first season of a new decade, appears authentic and maximalistic. A multi-faceted season surprising with joy of living. These are the key terms for the summer season 2010: value, authenticity and courage for fashionable highlights. This means for the silhouettes on the one hand a newly interpreted classic that is far away from rigid ready-to-wear clothing characterized by separates and combining casual wear with classic elements. On the other hand the play with shapes is not at all exhausted. The new hit of the season is the overall – either as casual slip-in made of jersey or of solid material depending on the segmentation. The Sarouel pants, too, ‘came across’ well spanning the genres – not just in denim, but also in subtly combed yarns and jersey in delicate lustre. Dresses are still omni-present – simple shirt dresses are equally represented with citations of the fifties with widely flared skirts and wide kaftan shapes with ethnic patterns. Like never before the materials vary and emphasize again the separates of the looks: light chiffon with leather leggings, sturdy linen combined with voile or batiste. Denim finds its way into all assortments and is bleached, moon-washed, perforated and repaired again – main thing ‘vintage’ – clean is out. Colour again has crystallized out as a means of styling that is indispensable and in the centre of interest besides the neutrals and a wide variety of earth- and olive shades. Sand, grey and concrete shades of de luxe reflect the need for timelessness and deceleration. Beside it the deep contrasts of a darkened, exotic world of colours bring about freshness. Climbers are the optimistic, romantic pastels accompanied by powerful accentuating colours that create tension and modernity. A world of colours stamped by the secrets of the primeval forests and the contrasting ethnic tribal garbs. The colours of natural lumber mixed with botanic accentuating colours: summer darks like deep dark-brown and violet beside darkened green and viper green. The neutrals are cuio and ivory. Accents are reached by mangoorange and dahliapink. The color palette of a future vision. A world of colors recalling high-tech laboratories of the 60s. Chilly, elegant, of a gentle dynamic. Classic black-white contrasts for uncompromising light effects. Electric-blue guarantees sportiness and freshens up the grey shades. Glimmering stardust is beside moonstone, bright slategrey with delicate greyviolet. Modern nomads, a colour story that timely implements the evergreen of the neutral sand shades. A new harmony of contrasting elements: relaxed calmness beside saturated, full color shades for details and fragments. Cinnamon, bronzeolive, zincgrey stand for an urban element. Birchbark and mudgrey find their contrast in lively mandarineorange, tomatored as well as ultravioletindigo. The optimistic world of amusement parks. The new pastels borrowed from the 50s can be tone on tone, used in a very feminine but also juvenile way. Delicate rosé is completed with powdery lilac as well as anise. A clear white and warm, slightly shimmering black beside a candyshoppink. A powerful petrol colour stimulates with new energy. This world of colours allows delicately elegant and also sporty, powerful color combinations. The jungle as one of the last unexplored ecosystems. Opulent, rich colouring and flora and fauna prints go together with Pop Art ending in an energetic style mix. The look is influenced by colorful ethnic tribes. What is new are the glam aspects combined with ethnic attributes. Voluminous tunika shapes are ideal for modern graphic patterns and build a good base for the summer accompanied by ultra-light voile dresses. The jackets offer a functional comfort and show pocket solutions that are subtly manufactured. Safari citations bring suspense. Overalls are a must-have. Accompanied by hot pants and pleated shorts the drainpipe will remain. A wide spectrum of jungle citations and animal prints from zebra over fancy giraffes up to leopard patterns is seen on leather and nylon. Net-like leather make giant pouches light like feathers. Braidings are seen at medium-sized city bags. Applications are endlessly versatile creating animated and unique surfaces. Fringes and braidings are utilized partially or extensively. Python designs are still in the running, but in a more abstract form: modified by patchwork or materialized by rivets. Combinations of fabric and leather are still fundamental and are combined with embroideries and batik printing. Variations range from Ethno Pop Art shoppers and weekenders to tiny bags on metal chains. Imagination in grip variations is a topmost thing – even contrasts like gold chains bring about a glamorous charm with the ethnic feeling. An overall cultivated look combined with a dash of “traveller”. Shaded patterns with attributes borrowed from the Hippies. The flora as a source of ideas for patterns and applications. Easiness and relaxation build the focus. Rustic ethnic designs are combined with techno details. Natural look for cotton and linen textiles with a visible authentic expression. A touch of „Jungle Party“ is in the air. 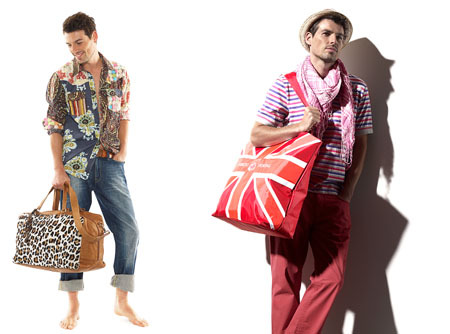 Men’s bags are a mix of down-to-earth and elegant. The bag with short grips is mostly equipped with an additional shoulder strap. Artisan saddler stitches create luxury at high level in the case of bowling bags and daybags. New are the PopUp colors for belts, straps and braids rendering a modern touch to weekenders. The applied leather is as soft as butter and combined with linings of high functionality and wear-resistance – or firm with a natural finish and partial braidings. The Couture Revolution of Courrèges from the 60s hits the style form of Jane Fonda’s Barbarella costumes. A modern and futuristic look uniting function and elegance. A precise shaping bringing together business chic and sportswear. The materials dominate the shape. A variety of surfaces appear with metallic lustre: creased foils is just one of the innovative new materials. Black-white contrasts come excitingly new in geometric patterns. Optical effects are reached by new lines and proportions. Waist accentuation, layering aspects and geometric shapes characterize the style. The new blazers have a sharp cut and yet a soft appearance. The shoulders are again accentuated. Shortened pleat trousers with a narrow leg are aside stocking-like drainpipe trousers, also in leather. Minimalism „plus“ is the heading for the bag shapes. Reduced and yet full of suspense. The surfaces are shining by metallized finishes, mat-brilliance contrasts and laminations. Multi-functionality is in the focus: partly reduced and unvisible inside business bags with metal grip or as attractive multi-zippers allowing the shapes to vary. The multitude of shapes spreads from ultra-soft pouches – that give an idea of extraterrestrial living forms by their ruffled contours - up to briefcases with an accentuated sharp cut. Suitcase attributes experience a revival: edged with a solid frame and firm, short grips – plain and significant. Clutches are either in geometric shapes or solid caskets. Plain metal attributes create a restrained decoration. The leather is almost structureless; finest nappa and velours are supplied with texture and broken-up surfaces by pleating, layering, and punching. The silhouettes vary from extra-slim to voluminous. The limits between sportswear and ready-made products blur, both segments are more and more influenced by active sports. Narrow cardigans are side by side with modern parkas and metallic-shimmering blousons. The pants shapes vary from narrow and clean with pleats to wide, relaxed variations in different lengths. Technical material with a cool grip and clean cotton define men’s world. The surfaces are vitalized by mat-lustre effects. Functionality is the key: demonstratively presented on the outside or almost invisibly positioned inside. The variety of materials stretches from finest, unstructured leather, partly with punch effects, to ballistic nylon. The volumes become moderate, presented in shopper formats and oblong weekenders. The hip bag, too, celebrates a comeback: publicized in Paris it refreshes the highly fashionable product lines. A mixture of vintage and urban ‚farmlife’ are the key note. Romance and the longing for a weekend in the countryside. A perfect mix of nonchalance and authenticity – always a dash of vintage paired with naturalness. New silhouettes are created by naturally mixing new shapes with classics. The material is natural and may well be uneven. Cotton and rough linen structures bring about easiness. Vintage celebrates a comeback: the textile looks worn by time with patina and colour irregularities. Trenchcoats and short coats with a „crispy“ grip will be of importance. Jackets are often oversized in „Boy Friend Look“ with a long lapel and without lining. Vests come in short and long shapes. Jodhpurs beside 7/8 length pleated trousers with summerly rolled-up pants legs. Hot pants remain of importance. Clothes and skirts seams are between knee length and ultra-short, mostly loose dresses in creased look or with a romantic touch with frills and pleats. By a combination with masculine jackets or coats the look appears ultramodern. What is new: small grip bags and clutches in basketwork. Punchings and applications highlight minimalistic shoppers and bags with pass-through. Croco is modernized by innovative shapes like geometric shoulder bags and nostalgic messenger bags. Pouches and shoppers in vintage look of cooked and aged leather. Grips and shoulder chains show wooden parts. Passes- through appear like jewels and grips like bracelets. Braidings are more fancy and used irregularly in combination with plain material. Colour irregularities and Tip Dye accentuate the vintage character with leather shoppers and linen bags. Simple pouches come in a new look by papery and crinkled leather creations. The leather is punched, perforated, pleated, and milled so that animated and authentic surfaces are attained. The American workwear and robust, slightly washed textiles bring the impulses. Naturalness is mixed with urban classic. Outfits tone on tone are freshened up by striking color signals. Relaxation in the silhouettes: always loose, never tight, extremely light and fluid in cut. Unconstructed coats combined with knee-length city bermudas. The mix of soft jackets with denim. Chino pants beside rolled-up pleated trousers. Layering of light cardigans over shirts in different lengths. A relaxed, leisure look. The beauty of the natural leather structures are in the foreground. Sand tanning, manually lubrified as well as structured leather. Patinated and aged reptile imprintings. Flap bags, shoulder bags and modernized soft briefcases with outstanding strap elements. Backpacks and small-format “reporter bags” in canvas with contrasting leather trimmings. Metal attributes are in the background – if at all used then quite reserved, tone on tone or in antique finish. An elated journey to the „Future of the Past“. The looks of the 20s, 50s, and 80s intermingle in a colourful carousel of new separates according to the motto: fashion is to bring fun, reality is hard enough. A topic full of tension that celebrates colour in a life affirming way. Graphic collages and a contrasting mix of dots, stripes and blossoms create pure fun for life. Fresh checks for trench coats and blouse shirts. Waisted skirts with swinging seams, allover-printed pants and loose-fitting dresses in romantic, playful style. Saharel pants made of firm cotton are combined with light and fluffy blouses and jersey tops. Nautic classics experience in a younger and ironic way a comeback. Box-shaped tops in the style of the 80s, striking embroideries, in new proportions and colourings. Decoration is allowed, rather partially and not too excessive: frills, three-dimensional flower applications and embroideries. As a contrast we find historic citations of masculine uniforms: trimmings, plaits, and epaulettes with fringes. Ironic citations of fine, miniature clip-lock bags: innocent in a soft rosé, but trimmed allover with rivets. Colourful, maritime plays with stripes for multi-variant pochettes, kitbags and square shoulder bags on elegant shoulder chains. Modern Classics is newly defined: bags in classic shaping like KellyBag, tote and clutch are modernized by means of colouring and novel metal attributes. Leather laces and eyelet embroidery put accents on medium-sized short-grip bags and envelope bags in soft Nappa. Decorative bows and medals as well as chain decoration and pearl grips for small shoulder bags. Plaits, buttons, and chains, simple or opulent, but always golden, refine the expression of sturdy plain leather. The easiness of classic seaside resorts resonates. Self-irony paired with a touch of humour. Casual attributes encounter the formal elegance of the 50s. Pastels are combined with neutral colour shades. The strong separate is dominating the look. T-shirts and shirts, above all, show colourful and lively patterns. Checked sports coats with shorts, sportswear with formal club charm. Shirts with a colourful flower design in combination with summer suits are beaming with vivid freshness. The statement is cheerful sportiness. At first glance not necessarily a men’s bag topic. However, as soon as grey, black or white is combined with pastels masculine fields of application occur. Bowling bags, hip packs and shining messenger bags in colour block and micro-designs. The message of the shapes becomes more sporty. The bag shapes vary from bowling bag over shoppers up to weekenders and visualize the „50’s Sports Club“. A shape revival is reached by tone on tone and mat-brilliant effects. American spirit in the mix with new shapes: slogan tees meet jersey Sarouel pants, oversized, light parkas in combination with „Jeggins“ or extremely tight drainpipes. Overalls in light cotton fabric and jersey. Denim is mostly seen in moonwash appearance and destroy elements. Biker jackets with straight boyfriend shapes and frill shirts. The Jeans jacket, too, has its comeback, often in acid wash. Shoppers, flap bags, and messenger bags from uni-colored over color blocks up to wildly patterned graffity look. Shoppers with pass-through and small doctor’s bags as well as soft pouches with partial rivet trimming. Backpacks are in the centre of interest: nylon and canvas for retro-hiking styles, contrasting colour blocks beside wild graffiti allover prints. New are leather backpacks in accentuated colours. Strong contrasts determine this colour story: clear college colours like footballred, baseballwhite and basketballblue are joined by tarblack, lipstickpink, poolturquoise and graffityviolet. Innovation is coalescing with set pieces of the 50s and 80s resulting in a new future look. Supplied by citations of past epochs, but newly appearing by the combinations: narrow blazers and sports jackets in interaction with low-waist carrot pants, jeans jackets in combination with pencil skirts and loosely hanging jersey tops, cocktail dresses with overdimensional blazers in the 80s look. Ever a mix of specific separates. Diverse epochs were here also the force behind the look – consequently resulting in a multitude of shapes: heart shapes slightly turned into kitsch on long shoulder straps over innovative pass-through solutions for shoppers, little pouches with a drawcord on long chains and straps. Attributed are applications in the form of bows, contrasting ribbons and patches. 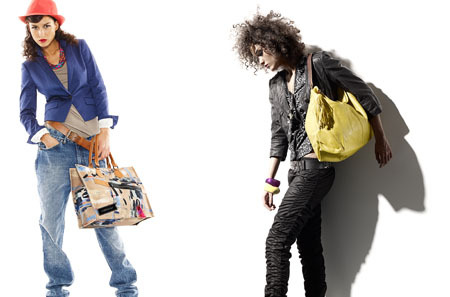 Nylon bags with innovative flap shapes and lock ideas bring about futurism to this topic also on the basis of new colorings. The base is black, white, and red freshened up by spaceblue, shuttlegrey, and night-skyblue. Individual accents are set by neonyellow as well as electricblue. Heritage and vintage denim play the major part – washed, ragged, with repairing elements, bleached and partial dirty washes – all is allowed and on purpose. The shape of the pants reach from super slim over boyfriend styles up to tapered denim pants with a low crotch and a narrow trouser leg. Also Chinos in bleached desert pastels experience a comeback. Checks as well as patchwork of Millefleur motives for loosely hanging dresses and jersey pants. The hot pant, too, plays a major role – in denim with rolled-up seam or plain in unicolour – mostly combined with smoothly hanging wide tops or vests. The bags pick up the topic particularly in respect of the surface design: the leather has a used, partially oiled or scuffed effect – in any case trimmed old. Cross-dyed, washed and waxed surface for horizontal shoulder bags, shoppers as well as weekenders. Aviator bags and map bags in matured, solid natural leather as well as matchsacks and backpacks in army design. Canvas is washed, bleached or partly processed with open edges. The shapes vary from big shoppers in vertical and horizontal format and daypacks up to voluminous pouches. The colours reflect a story of naturally aged leather: brown in all its variations is completed by vintagered, olivegreen and poporange, accentuated by limegreen and grassgreen. Set pieces from the cultures of this world supply attributes to the look. Far-eastern batik techniques encounter kaftan-like tunika and leggings. African-inspired designs on box-shaped tops in combination with narrow bermudas. Light summer dresses with ethnic prints in the lengths mini to maxi. Overalls in washed look, jersey tops in colourful print mix of animal patterns, checks, and dots. All that with applications of gemstones, pearls and sequins – folk meets glam. Pouches in various sizes are dominating: with batik effects and handstitched elements, braiding, fringes and wooden grips. Partial imprints, ethnic prints, and press cuttings supply a tribal look for soft shoulder bags as well as large-format clutches and shoppers. New are meshed pouches with contrasting imprinted lining or pearl decoration. Daybags and soft banana shapes in cotton are printed with imaginative flowers, animal drawings as well as summery photo motives. The blaze of colours of African market places: brown shades close to nature are beside black/white contrasts. Violet is next to shining magenta and bananayellow. Accents are attained by mangoorange, dahliapink, and grassgreen.